The Battle of Vimy Ridge was a military engagement fought primarily as part of the Battle of Arras, in the Nord-Pas-de-Calais region of France, during the First World War. The main combatants were the Canadian Corps against three divisions of the German Sixth Army. 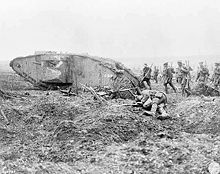 The battle, which took place from 9 April to 12 April 1917, was part of the opening phase of the British-led Battle of Arras, a diversionary attack for the French Nivelle Offensive. The objective of the Canadian Corps was to take control of the German-held high ground along an escarpment at the northernmost end of the Arras Offensive. This would ensure that the southern flank could advance without suffering German enfilade fire. Supported by a creeping barrage, the Canadian Corps captured most of the ridge during the first day of the attack. The town of Th�lus fell during the second day of the attack, as did the crest of the ridge once the Canadian Corps overcame a salient of considerable German resistance. The final objective, a fortified knoll located outside the town of Givenchy-en-Gohelle, fell to the Canadian Corps on 12 April. 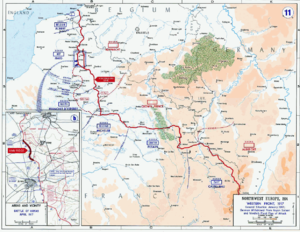 The German forces then retreated to the Oppy-M�ricourt line. Vimy Ridge is an escarpment 8 kilometres (5.0 mi) northeast of Arras on the western edge of the Douai Plains. The ridge gradually rises on its western side dropping more quickly on the eastern side. At approximately 7 kilometres (4.3 mi) in length and culminating at an elevation of 145 metres (476 ft) or 60 metres (200 ft) above the Douai Plains, the ridge provides a natural unobstructed view for tens of kilometres in all directions. The ridge fell under German control in October 1914 during the Race to the Sea as the Franco-British and German forces continually attempted to outflank each other through north-eastern France. The French Tenth Army attempted to dislodge the Germans from the region during the Second Battle of Artois in May 1915 by attacking their positions at Vimy Ridge and Notre Dame de Lorette. The French 1st Moroccan Division managed to briefly capture the height of the ridge, but was unable to hold it owing to a lack of reinforcements. The French made another attempt during the Third Battle of Artois in September 1915, but only captured the town of Souchez at the western base of the ridge. The Vimy sector calmed following the offensive with both sides taking a largely live and let live approach. The French suffered approximately 150,000 casualties in their attempts to gain control of Vimy Ridge and surrounding territory. The British XVII Corps, commanded by Lieutenant-General Sir Julian Byng, relieved the French Tenth Army in the sector in February 1916, permitting the French to expand their operations at Verdun. The British soon discovered that German tunnelling companies had taken advantage of the relative calm on the surface to build an extensive network of tunnels and deep mines from which they would attack French positions by setting off explosive charges underneath their trenches. The Royal Engineers immediately deployed specialist tunnelling companies along the front to combat the German mining operations. In response to increased British mining aggression, German artillery and trench mortar fire intensified in early May 1916. 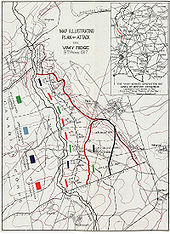 On 21 May 1916, after shelling both forward trenches and divisional artillery positions from no less than 80 out-of-sight batteries on the reverse slope of the ridge, the German infantry attacked the British lines along a 2,000-yard (1,800 m) front in an effort to eject them from positions along the ridge. The Germans successfully captured several British-controlled tunnels and mine craters before halting their advance and entrenching their positions. Small counterattacks by units of the 140th and 141st British Brigades took place on 22 May, but did not manage to change the situation. The Canadian Corps relieved the British IV Corps stationed along the western slopes of Vimy Ridge in October 1916. Formal discussions for a spring offensive near Arras began following a conference of corps commanders held at British First Army Headquarters on 21 November 1916. On 5 January 1917, Lieutenant-General Sir Julian Byng took command of the Canadian Corps from Lieutenant-General Sir E.A.H. Alderson. In March 1917, British First Army headquarters formally presented Byng with orders outlining Vimy Ridge as the corps's objective for the Arras Offensive. The adoption of a formal assault plan took place in early March 1917 and drew heavily on the briefings of staff officers sent to learn from the experiences of the French Army during the Battle of Verdun. For the first time all four Canadian divisions were assembled to participate in a battle together. The nature and size of the planned Canadian Corps assault necessitated support and resources beyond its normal operational capabilities. Consequently, the British 5th Infantry Division and supplementary artillery, engineer and labour units reinforced the four Canadian divisions already in place. This brought the nominal strength of the Canadian Corps to about 170,000 men, of whom 97,184 were Canadians. In January 1917, three Canadian Corps officers accompanied other British and Dominion officers attending a series of lectures hosted by the French Army regarding their experiences during the Battle of Verdun. The French counter offensive devised by General Robert Nivelle was one of the limited Allied successes of 1916. Following extensive rehearsal, eight French divisions assaulted German positions in two waves along a 6-mile (9.7 km) front. Supported by exceedingly strong artillery, the French recovered lost ground and inflicted heavy casualties on five German divisions. On their return, the Canadian Corps staff officers produced a tactical analysis of the Verdun battles and delivered a series of corps and divisional-level lectures to promote the primacy of artillery and stress the importance of harassing fire and company and platoon flexibility. The report of 1st Canadian Division commander Arthur Currie in particular highlighted lessons he believed the Canadian Corps could learn from the experiences of the French. The assault plan ultimately drafted for the assault on Vimy Ridge drew heavily on the experiences and tactical analysis of the officers who attended the Verdun lectures. First Army commander General Henry Horne approved the plan on 5 March 1917. The plan divided the Canadian Corps advance into four coloured objective lines. The attack would be made on a front of 7,000 yards (6,400 m), the centre being opposite the village of Vimy, which lay to the east side of the ridge. The Black Line, the first objective, involved the seizure of the German forward defensive line. The final objective of the northern flank was the Red Line, which involved the taking of the highest point on the ridge, the fortified knoll known as "The Pimple" (50�23′43″N 2�45′25″E﻿ / ﻿50.39528�N 2.75694�E﻿ / 50.39528; 2.75694), the Folie Farm, the Zwischen-Stellung trench and the hamlet of Les Tilleuls. 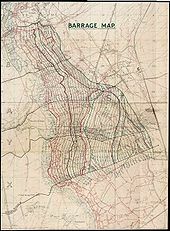 The southern two divisions had to achieve two additional objectives: the Blue Line encompassing the town of Th�lus and the woods outside the town of Vimy, and the Brown Line, which involved capturing the Zwx�lfer-Graben trench and the German second line. The infantry would proceed close behind a creeping barrage placed down by light field guns, advancing in timed 100-yard (91 m) increments. The medium and heavy howitzers would establish a series of standing barrages further ahead of the infantry against known defensive systems. The plan called for units to leapfrog over one another as the advance progressed in order to maintain momentum during the attack. The initial wave would capture and consolidate the Black Line and then push forward to the Red Line. The barrage would pause, to enable reserve units to move up, and then move forward with the units pushing beyond the Red Line to the Blue Line. Once the corps secured the Blue Line, advancing units would once again leapfrog established ones and capture of the Brown Line. Conducted properly, the plan would leave the Germans forces little time to exit the security of their deep dugouts and defend their positions against the infantry advance. If the corps maintained its schedule, the troops would advance as much as 4,000 yards (3,700 m) and have the majority of the ridge under control by 1:00 pm of the first day. The experience of the Battle of the Somme led the German command to conclude that the policy of rigidly defending a statically fixed line was no longer effective and could not be relied upon as a defensive strategy. As a result, the German command began espousing a new defensive doctrine in December 1916, one that emphasized fighting an elastic defensive battle in depth, rather than rigidly holding successive lines of trenches. Along Vimy Ridge, the German forces spent two years constructing fortifications designed in accordance with the old doctrine of rigid defence. Little reconstruction based upon the new defence-in-depth doctrine had been accomplished by April 1917. The geography of the Vimy battlefield made the doctrine of defence-in-depth difficult to execute. The ridge was as little as 700 metres (2,300 ft) wide at its narrowest point and dropped off quickly on its eastern side, all but eliminating the possibility of counterattacks in the event an Allied assault captured the ridge. The Germans recognized these issues and were extremely concerned about the inherent weaknesses of the geographic setting and the overall dependability of their position. The German defensive strategy was to operate a front line defence of sufficient strength to defend against an initial assault and move operational reserves forward before the enemy could consolidate their gains or overrun remaining German positions. As a result, the German defence at Vimy Ridge relied largely on machine guns, which acted as force multipliers for the defending infantry. Three line divisions, with seven infantry regiments between them, were responsible for the immediate defence of the ridge. The established strength of each division was approximately 15,000 men. However, the actual strength of the German forces was significantly less. In 1917, a full-strength German rifle company consisted of 264 men; at Vimy Ridge, each rifle company contained approximately 150 men. Each German regiment was by design responsible for staffing approximately 1,000 metres (1,100 yd) of front including its depth of defence back to the rear area. As a result, when the Canadian Corps attacked, each German company initially faced two or more battalions of approximately one thousand men each. Reserve divisions were kept approximately 15 miles (24 km) behind the front lines instead of assembling close behind the second line as espoused by the defence-in-depth doctrine. The Canadian Corps’ divisional artillery formations, totalling eight field brigades and two heavy artillery groups, was insufficient for the task at hand and were consequently reinforced with outside formations. Four heavy artillery groups, nine artillery field brigades, three divisional artillery groups and the artillery complement of the British 5th Division was attached to the Canadian Corps. In addition, ten heavy artillery groups of the flanking I and XVII Corps were assigned tasks in support of the Canadian Corps. The artillery batteries of I Corps were particularly important because they enfiladed German gun positions behind Vimy Ridge. In total, the British made available to the Canadian Corps twenty-four brigade artillery groups consisting of four hundred and eighty 18 pounder field guns, one hundred thirty-eight 4.5 inch howitzers, ninety-six 2 inch trench mortars, twenty-four 9.45 inch mortars, supported by 245 corps-level siege guns and heavy mortars. This firepower gave a density of one heavy gun for every 20 yards (18 m) and one field gun for every 10 yards (9.1 m) of Canadian Corps frontage, representing a considerable average increase, including three times the heavy guns, over the distribution of artillery at the Battle of the Somme a year earlier. Brigadier-General Edward Morrison developed and subsequently issued a 35 page multi-phased fire support plan called Canadian Corps Artillery Instruction No. 1 for the Capture of Vimy Ridge to support the efforts of the infantry. For its operations, the Canadian Corps received three times the artillery normally assigned to a corps for regular operations. To manage the logistics associated with the increased artillery, Royal Artillery staff officer Major Alan Brooke developed coordinated communication and transport plans to work in conjunction with the complex barrage plans. A 1.6 million shell allotment allowed the artillery along the Canadian Corps front to maintain a high sustained rate of fire. Improvements in the quality of the shells compared to those used earlier in the war ensured fewer duds. The introduction of the instantaneous No. 106 fuze greatly improved the effectiveness of the artillery since this fuse burst reliably with the slightest of contact, unlike older timed fuses, making it especially effective at cutting barbed wire before the advance. To maintain communications during the battle, particularly with the artillery, field units laid over 1,400 kilometres (870 mi) of telegraph and field telephone cabling, normally at a depth of 7 feet (2.1 m). In addition, the corps conducted coordinated counter-battery initiatives before the battle. The First Army Field Survey Company printed barrage maps for all batteries, produced artillery boards and provided counter-battery support with their flash spotting groups and sound ranging sections.. Utilizing flash spotting, sound ranging and aerial reconnaissance from No. 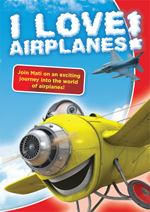 16 Squadron, and No. 1 & 2 Balloon Company of the Royal Flying Corps in the week before the battle, the counter battery artillery under command of Lieutenant-Colonel Andrew McNaughton fired 125,900 shells, harassing an estimated 83% of the German gun positions. In February 1917, the British General Staff released a training pamphlet titled SS 143 Instructions for the Training of Platoons for Offensive Action, espousing the return to the pre-war emphasis on fire and movement tactics and the use of the platoon as a self-contained tactical unit. The short pamphlet noted the importance of dedicated hand grenade, rifle grenade and machine gun sections in suppressing enemy strong points with an appropriate level of fire to permit other military units to advance. Coupled with the observations and suggestions made by Currie in the report he submitted in January 1917 following the Verdun lectures, the Canadian Corps instilled the tactical change with vigour. The corps instilled the tactical doctrine for small units by assigning objectives down to the platoon level. Assaulting infantry battalions used hills behind the lines as full-scale model representations of the battlefield. Taped lines demarcated German trench lines while officers on horseback carried flags to represent the advancing front of the artillery barrage. Recognizing that the men in leadership positions were likely to be wounded or killed, soldiers learned the jobs of those beside and above them. 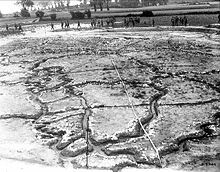 At the British First Army headquarters, a large-scale plasticine model of the Vimy sector was constructed and used to show commissioned and senior non-commissioned officers the topographical features of the battlefield and details of the German trench system. In addition, upwards of 40,000 topographical trench maps were printed and distributed to ensure that even platoon sergeants and section commanders possessed a wider awareness of the battlefield. These measures gave each platoon a clearer picture of how it fitted into the greater battle plan, and in so doing, reduced the command and control problems that plagued First World War combat. The Arras-Vimy sector was conducive to tunnel excavation owing to the soft, porous yet extremely stable nature of the chalk underground. As a result, pronounced underground warfare had been an active feature of the Vimy sector since 1915. The Bavarian engineers, for example, had blown 20 mines in the sector by March 1915. By early 1916 the Germans miners had gained a clear advantage over their French counterparts. On their arrival, the British Royal Engineer tunnelling companies became actively engaged in offensive mining against German miners. First stopping the German underground advance and then developing a defensive strategy that prevented the Germans from gaining a tactical advance through their mining activities. By 1917, no fewer than 19 distinct crater groups existed along the section of the front. Each group often containing several large craters all of which were the result of explosions caused by underground mine warfare. In preparation for the assault, British tunnelling companies created extensive underground networks and fortifications. 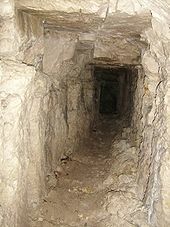 Twelve subways, up to 1.2 kilometres (1,300 yd) in length, were excavated at a depth of 10 metres (33 ft) and utilized to connect reserve lines to front lines, permitting soldiers to advance to the front quickly, securely and unseen. Often incorporated into subways were concealed light rail lines, hospitals, command posts, water reservoirs, ammunition stores, mortar and machine gun posts, and communication centres. The Germans dug a number of similar tunnels on the Vimy front to provide covered routes to front lines and large-scale protection for headquarters, resting personnel, equipment and ammunition. To protect some advancing troops from German machine gun fire, as they crossed no man's land during the attack, eight specialized mine charges were laid at the end of the subways. These specialized mine charges were designed to allow troops to move more quickly and safely enter the German trench system by creating an elongated trench-depth crater that spanned the entire length of no man's land. In an effort to destroy some German surface fortifications before the assault, the British tunnelling companies secretly laid 13 large explosive charges directly under German positions. However, this work did not go unimpeded. The Germans actively counter-mined British tunnelling and were successful in destroying a number of British attempts at placing offensive mines under or near their lines. Of the explosive charges laid by the British, three mines were fired before the assault, another three mines and two specialized charges were fired at the start of the attack. Trench raiding involved making small-scale surprise attacks on enemy positions, often in the middle of the night for reasons of stealth. All belligerents employed trench raiding as a tactic to harass their enemy and gain intelligence. In the Canadian Corps trench raiding developed into a training and leadership-building mechanism. The size of a raid would normally be anything from a few men to an entire company, or more, depending on the size of the mission. The four months before the April attack saw the Canadian Corps execute no fewer than 55 separate trench raids. 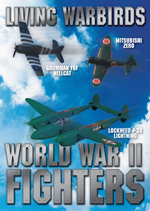 Competition between units even developed with units competing for the honour of greatest number of prisoners captured or most destruction wrought. The policy of aggressive trench raiding was not without its cost. A large-scale trench raid on 13 February 1917, involving 900 men from the 4th Canadian Division, resulted in 150 casualties. An even more ambitious trench raid on 1 March 1917, once again by the 4th Canadian Division, failed and resulted in 637 casualties including two battalion commanders and a number of company commanders killed. This experience did not lessen the extent to which the Canadian Corps employed trench raiding with raids being conducted nightly between 20 March and the opening of the offensive on 9 April, resulting in approximately 1,400 additional Canadian casualties. The Germans operated an active patrolling policy and although not as large and ambitious as those of the Canadian Corps, they also engaged in trench raiding. 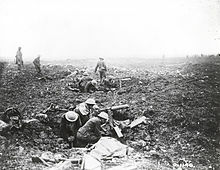 As an example, a German trench raid launched by 79 men against the 3rd Canadian Division on 15 March 1917 was successful in capturing prisoners and causing damage. The Royal Flying Corps launched a determined effort to gain air superiority over the battlefield in support of the spring offensive. The Canadians considered activities such as artillery spotting, and photography of opposing trench systems, troop movements and gun emplacements essential to continue their offensive. The Royal Flying Corps deployed 25 squadrons totalling 365 aircraft along the Arras sector, outnumbering the Imperial German Army Air Service by 2-to-1. Byng was given use of No. 2 Squadron, No. 8 (Naval) Squadron (part of the Royal Naval Air Service), No. 25 Squadron, No. 40 Squadron and No. 43 Squadron, with No. 16 Squadron permanently attached to the Canadian Corps and employed exclusively for observation and artillery support. 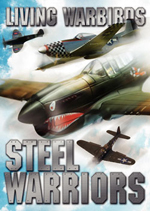 Aerial reconnaissance was often a hazardous task because of a requirement to fly at slow speeds and at low altitudes. The task was made all the more dangerous with the arrival of additional German flying squadrons, including Manfred von Richthofen's highly experienced and well equipped Jasta 11, which led to sharp increase in Royal Flying Corps casualties. Although significantly outnumbering the Germans, the Royal Flying Corps lost 131 aircraft during the first week of April alone. Despite the losses suffered by the Royal Flying Corps, the Imperial German Army Air Service failed to prevent the Royal Flying Corps from carrying out its prime objective, namely the continued support of the army throughout the Arras Offensive with up-to-date aerial photographs and reconnaissance information. German Sixth Army commander General Ludwig von Falkenhausen was responsible for the Cambrai-Lille sector and commanded 20 divisions (plus reserves). Vimy Ridge itself was principally defended by the ad hoc Gruppe Vimy formation based under I Bavarian Reserve Corps commander General der Infanterie Karl Ritter von Fasbender. However, a division of Gruppe Souchez, under VIII Reserve Corps General Georg Karl Wichura, was involved in the frontline defence along the northernmost portion of the ridge. Three divisions were ultimately responsible for manning the frontline defences opposite the Canadian Corps. The 16th Bavarian Infantry Division was located opposite the town of Souchez and responsible for the defence of the northernmost section of the ridge. The division was created in January 1917 through the amalgamation of existing Bavarian formations and had so far only opposed the Canadian Corps. The 79th Reserve Division was responsible for the defence of the vast central section including the highest point of the ridge, Hill 145. The 79th Reserve Division fought for two years on the Eastern Front before being transferred to the Vimy sector at the end of February 1917. The 1st Bavarian Reserve Division had been in the Arras area since October 1914 and was holding the towns of Th�lus, Bailleul and the southern slope of the ridge. Canadian Corps commander Lieutenant-General Sir Julian Byng commanded four attacking divisions, one division of reserves and numerous support units. He was supported to the north by the 24th British Division of I Corps, which advanced north of the Souchez river and by the advancing XVII Corps to the south. The 4th Canadian Division was responsible for the northern portion of the advance that included the capture of the highest point of the ridge followed by the heavily defended "Pimple" just west of the town of Givenchy-en-Gohelle. The 3rd Canadian Division was responsible for the narrow central section of the ridge, including the capture of La Folie Farm. The 2nd Canadian Division, which later included an additional brigade from the 5th British Division, was directly south of 3rd Canadian Division and entrusted with the capture of the town of Th�lus. The 1st Canadian Division was responsible for the broad southern sector of the corps advance and expected to make the greatest advance in terms of distance. Byng planned for a healthy reserve for contingencies that included the relief of forward troops, help in consolidating positions and aiding the 4th Canadian Division with the capture of the "Pimple". As a result, the 9th Canadian Brigade, 15th British Brigade and 95th British Brigade were kept in corps-level reserve. The preliminary phase of the Canadian Corps artillery bombardment began on 20 March 1917, with a systematic two-week bombardment of German batteries, trenches and strong points. The Canadian Corps paid particular attention to eliminating German barbed wire, a task made easier with the introduction of the No. 106 instantaneous fuse. In addition, only half of the available artillery was committed at any one point in time with the intensity of the barrage expressly varied as to confuse the Germans and preserve some level of secrecy. 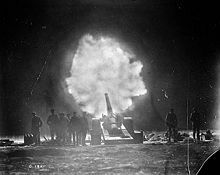 Phase two lasted the entire week beginning 2 April 1917 and employed the entire artillery arsenal at the disposal of the Canadian Corps, massing the equivalent of one heavy gun for every 20 yards (18 m) and one field gun for every 10 yards (9.1 m). The German soldiers came to refer to the week before the attack as 'the week of suffering'. By the Germans' own account, their trenches and defensive works were almost completely demolished. Furthermore, German health and morale suffered from the stress of remaining at the ready for eleven straight days under extremely heavy artillery bombardment. Compounding German difficulties was the inability of ration parties to bring food supplies to the front lines. 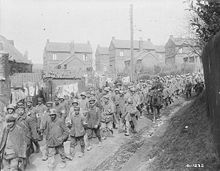 On 3 April, General von Falkenhausen ordered his reserve divisions to prepare to relieve frontline divisions over the course of a long drawn-out defensive battle, in a manner similar to the Battle of the Somme. However, the divisions were kept 15 miles (24 km) from the battlefield to avoid being shelled. The attack was to begin at 5:30 am on Easter Monday, 9 April 1917. The attack was originally planned for the morning of 8 April (Easter Sunday), but it was postponed for 24 hours at the request of the French. During the late hours of 8 April and early morning of 9 April the men of the leading and supporting wave of the attack were moved into their forward assembly positions. The weather was cold and later changed to sleet and snow. Although physically discomforting for everyone, the north-westerly storm provided some advantage to the assaulting troops by blowing snow in the faces of the defending troops. Light Canadian and British artillery bombardments continued throughout the prior night but stopped in the few minutes before the attack, as the artillery recalibrated their guns in preparation for the synchronized barrage. At exactly 5:30 am, every artillery piece at the disposal of the Canadian Corps began firing. Thirty seconds later, engineers detonated the mine charges laid under no man's land and the German trench line, destroying a number of German strong points and creating secure communication trenches directly across no man's land. Light field guns laid down a barrage that advanced in predetermined increments, often 100 yards (91 m) every three minutes, while medium and heavy howitzers established a series of standing barrages further ahead, against known defensive systems. During the early fighting the German divisional artilleries, despite heavy losses, were able to maintain their defensive firing. As the Canadian assault advanced, it overran many of the German guns because there was no means of moving them to the rear on account of many of the horses being killed in the initial gas attack. The 1st, 2nd and 3rd Canadian Divisions reported reaching and capturing their first objective, the Black Line, by 6:25 am. The 4th Canadian Division encountered a great deal of trouble during its advance and was unable to complete its first objective until some hours later. After a planned pause, when the 1st, 2nd and 3rd Canadian Divisions consolidated their positions, the advance resumed. Shortly after 7:00 am, the 1st Canadian Division captured the left half of its second objective, the Red Line, and moved the 1st Canadian Brigade forward to mount an attack on the remainder. The 2nd Canadian Division reported reaching the Red Line and capturing the town of Les Tilleuls at approximately the same time. 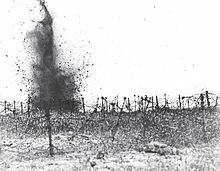 A mine explosion that killed many German troops of the Reserve Infantry Regiment 262 manning the front line preceded the advance of the 3rd Canadian Division. The remaining German troops could do no more than man temporary lines of resistance until later manning a full defence at the German third line. 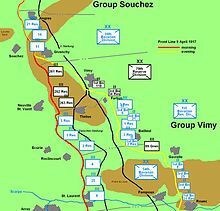 As a result, the southern section of the 3rd Canadian Division's was able to reach the Red Line at the western edge of the Bois de la Folie at around 7:30 am. At 9:00 am the division learned of its exposed left flank, as the 4th Canadian Division had not yet captured Hill 145. The 3rd Canadian Division was thus called upon to establish a divisional defensive flank to its north. Although the German commanders were able to maintain open lines of communication and issue operating orders, even with swift staff work the tempo of the assault was such that German decision cycle was unable to react decisively. 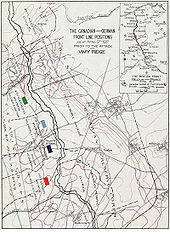 The British moved three fresh brigades up to the Red Line by 9:30 am on 10 April to support the advance of the 1st and 2nd Canadian Division, whereupon they were to leapfrog existing units occupying the Red line and advance to the Blue Line. Fresh units including two sections of tanks and the 13th British Brigade were called up from reserve to support the advance on the 2nd Canadian Division. By approximately 11:00 am, the Blue Line, including Hill 135 and the town of Th�lus, had been captured. To permit the troops time to consolidate the Blue Line, the advance halted and the barrage remained stationary for 90 minutes while machine guns were brought forward. Shortly before 1:00 pm, the advance recommenced with both the 1st and 2nd Canadian Divisions reporting their final objective. The tank supported advance via Farbus, and directed at the rear of the 79th Reserve Division, was eventually halted by concentrated German fire short of the village. The Canadian 1st and 2nd Divisions were nonetheless able to secure the Brown Line by approximately 2:00 pm. The 4th Canadian Division made an attempt to capture the northern half of Hill 145 at around 3:15 pm, briefly capturing the peak before a German counterattack retook the position. The Germans occupying the small salient on ridge soon found themselves being attacked along their flanks by continuously reinforced Canadian Corps troops. When it became obvious that the position was completely outflanked and there was no prospect of reinforcement, the German troops pulled back. The German forces were evacuated off the ridge with German artillery batteries moved west of the Vimy-Bailleul railway embankment or to the Oppy-M�ricourt line. By nightfall of 10 April, the only Canadian objective not yet achieved was the capture of the "Pimple". The 4th Canadian Division faced difficulties at the start of the battle that forced it to delay its assault on the "Pimple" until 12 April. The “Pimple” was initially defended by the 16th Bavarian Infantry Division, but the Canadian Corps' preliminary artillery bombardment leading up to the assault on 9 April caused heavy casualties amongst its ranks. On 11 April, the 4th Guards Infantry Division first reinforced and then relieved affected 16th Bavarian Infantry Division units. The night before the attack, artillery harassed German positions while a gas section of Royal Engineers, employing Livens Projectors, fired more than 40 drums of gas directly into the town of Givenchy-en-Gohelle to cause confusion. The defending German troops managed to drive back the initial Canadian assaults at around 4:00 am using small arms fire. The 10th Canadian Brigade attacked once again at 5:00 am, this time supported by a significant amount of artillery and the 24th British Division of I Corps to the north. The German defensive artillery fire was late and too light to cause the assaulting troops great difficulty, allowing the Canadian Corps to exploit wide gaps and break into the German positions. The 10th Canadian Brigade, assisted by snow and a Westerly wind, fought hastily entrained German troops to capture the entire "Pimple" by 6:00 pm. Private William Johnstone Milne of the 16th (Canadian Scottish) Battalion. Lance-Sergeant Ellis Wellwood Sifton of the 18th (Western Ontario) Battalion. Private John George Pattison of the 50th (Calgary) Battalion. Oberstleutnant Wilhelm Von Goerne commander of the 261st Prussian Reserve Infantry Regiment, of the German 79th Reserve Division. General der Infanterie Georg Karl Wichura commander of the VIII Reserve Corps and Gruppe Souchez. Picture - German soldiers captured during the battle. Following the defeat, the Chief of the German General Staff, Field Marshal Paul von Hindenburg, ordered the Supreme Army Command to conduct a court of enquiry into the defensive collapse of the Arras sector. The court concluded that the Sixth Army headquarters had disregarded frontline commander reports, noting a possible imminent attack, and as a result, reserve units were kept too far back to execute a timely and effective counterattack. The court concluded that Sixth Army commander General Ludwig von Falkenhausen failed to apply an elastic defence properly as espoused by German defensive doctrine of the time. Instead, the defensive system was a series of unmoving strong points and static lines of resistance, which the Canadian artillery ultimately isolated and destroyed. As a result of the inquiry, Hindenburg removed Von Falkenhausen from his command and transferred him to Belgium where he served the remainder of the war as that country's Governor General. The Germans did not see the Canadian Corps's capture of Vimy Ridge as a loss. Contemporary German sources viewed the action, at worst, as a draw, given that no full-scale breakthrough occurred following the attack. The Germans did not attempt to recapture the ridge, even during the Spring Offensive, and it remained under British control until the end of the war. The loss of Vimy Ridge forced the Germans to reassess their defensive strategy in the area. 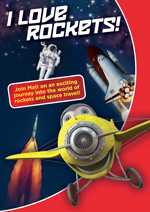 Instead of mounting a counterattack, they pursued a scorched earth policy, and retreated to the Oppy-M�ricourt line. The complete failure of the French Nivelle Offensive in the week after the Arras Offensive placed pressure on Field Marshal Douglas Haig to keep the Germans occupied in the Arras sector to minimize French losses. The Canadian Corps participated in several of these actions including the Battle of Arleux and the Third Battle of the Scarpe in late April and early May 1917. The Battle of Vimy Ridge has considerable significance for Canada. Although the battle is not generally considered the greatest achievement of the Canadian Corps in terms of strategic importance or results obtained, it was the first instance in which all four Canadian divisions, made up of troops drawn from all parts of the country, fought as a cohesive formation. The image of national unity and achievement is what initially gave the battle importance for Canada. According to Pierce, "The historical reality of the battle has been reworked and reinterpreted in a conscious attempt to give purpose and meaning to an event that came to symbolize Canada's coming of age as a nation." The idea that Canada's national identity and nationhood were born out of the battle is an opinion that is widely held in military and general histories of Canada. Outside of Canada the battle has much less significance and is simply noted as being one part of the larger offensive of the Battle of Arras. The Canadian National Vimy Memorial is Canada's largest and principal overseas war memorial. Located on the highest point of the Vimy Ridge, the memorial is dedicated to the commemoration of the Battle of Vimy Ridge and Canadian Expeditionary Force members killed during the First World War. It serves as the place of commemoration for Canadian soldiers killed in France during the First World War with no known grave. France granted Canada perpetual use of a section of land at Vimy Ridge in 1922 for the purpose of a battlefield park and memorial. A 250-acre (100 ha) portion of the former battlefield is preserved as part of the memorial park that surrounds the monument. The grounds of the site are still honeycombed with wartime tunnels, trenches, craters and unexploded munitions, and is largely closed off for public safety. However, a section of preserved trenches and a portion of a tunnel have been made accessible to site visitors. 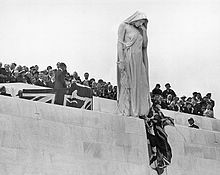 The memorial took eleven years and $1.5 million to build and was unveiled on 26 July 1936 by King Edward VIII, in the presence of President Albert Lebrun of France and 50,000 or more Canadian and French veterans and their families. Starting in 2004, the monument underwent a major multi-year restoration project, which included general cleaning and the recarving of many inscribed names. Queen Elizabeth II rededicated the restored monument on 9 April 2007 during a ceremony commemorating the 90th anniversary of the battle. Veterans Affairs Canada maintains the memorial site.